We chose to part, with great difficulty, Elsa. We are very excited she is now at Three Ring Farms with the Balmer family. We know we will see her at all our shows and she will be really spoiled. We were not orginally going to keep Elsa, but Emilie claimed her so we made a deal that I could name Temptation's doe WiFi Kitty that she could keep her. Elsa is a flashy blue eyed creme buckskin and very dairy. She comes from a nice line of milkers and show does so we hope she is going to be a keeper. 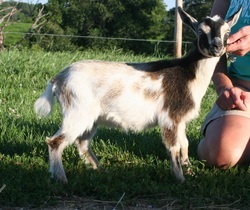 She will be showing at her first show this August at the Illinois State Fair. She was the smallest of the triplet from Two Dogs Farm Hermoine so we will give her a chance to grow and catch up to the other kids that were born this spring.